Steve Stinson is a freelance writer, designer, and artist who created the comic strips RFD 2 and Hamlet in the 1980s. He lives in Roanoke, Virginia. Squiffy is the idea man in his neighborhood. The Vine Street Boys--Tank Who Weighs a Ton, Dan and Don the Almost Identical Twins, Stinkbug, Brero the Vaquero, Katz Who Carries a Pencil, and the soccer team --are his willing accomplices. 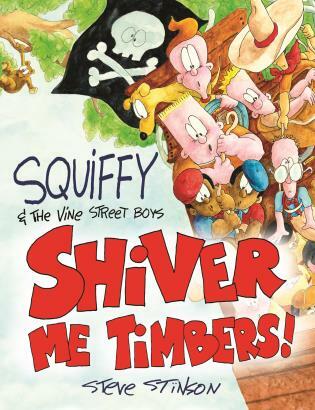 Squiffy’s scheme is to build a pirate ship on the crown of a tree, and invite all eighteen of the Vine Street Boys to join him. What happens next is both predictable and hilarious as Squiffy takes command of his ship and its pirate crew in its precarious perch atop the tree.